A promised update to the previous post on the upcoming toll price hike, the highways that will be affected are the Guthrie Corridor Expressway, Karak Highway, Grand Saga Cheras-Kajang Highway, Lebuhraya Damansara Puchong (LDP) and Kesas Shah Alam Highway. 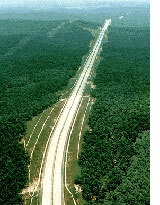 Estimated toll subsidies for all the highways are expected to be RM2 billion if toll subsidies are not reduced. As for how much we’ll suffer, that amount is still under study, but the last toll price increase in early 2005 saw the Plus Expressway toll rates going up by 10% on the North-South Expressway, while previously Kesas upped prices in 2002. Assuming the subsidies of RM2 billion are to be cut in half or a quarter, that would be a savings of RM1 billion (a palace, a foreign sports complex and a space trip) or RM500 million (a foreign sports complex and a space trip) respectively. Well, the choice of where to spend the money was obvious, as the other projects are so much more important than keeping the toll rates affordable for us!